Kohler Power Systems has launched a new Mobile Paralleling Box, which delivers cutting-edge flexibility by allowing users to combine different sized generators with different fuel types. It has specifically been designed for use with Kohler’s gaseous and diesel mobile generator line. The new Mobile Paralleling Box, along with a fleet of Kohler generators, allows users to mix and match different size generators to meet job requirements. Four of the new boxes can be used to parallel as many as eight generators. The Kohler Decision-Maker 3500 digital controller, which is standard on all Kohler gaseous and Tier Four Final diesel mobile generators, provides the paralleling intelligence and network communications for remote monitoring. “Any Kohler mobile generator with the Decision-Maker 3500 digital controller will work with the Mobile Paralleling Box,” says Feudner. The digital controller, along with the new Mobile Paralleling Box, makes it possible to parallel generators for applications such as using multiple smaller units to replace a larger generator, thus providing redundancy to a primary generator in support of critical loads, meeting system capacity demands when one generator is inadequate, or managing generators to be sequenced on or off in a predetermined order based on system output. The new system uses contactors to connect to the bus and eliminates the need for installing or investing in motorised breakers on generators that may never be used in a parallel application. Each contactor is rated at 1,000 amps – different sized generators can parallel as long as each unit’s output is less than 1,000 amps. “The advantage of the new paralleling system is that it removes the need to size circuit breakers to specific generator output,” Feudner points out. Colour-coded camlocks for input and output feeds make the new box easy to set up and maintain while unused camlock connectors are protected with lockable security bars. 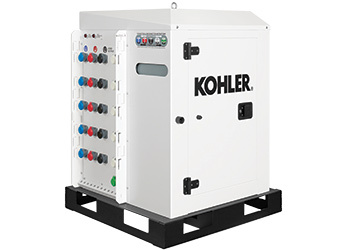 During the 2015 PGA Championship in the US, the Mobile Paralleling Box from Kohler Power Systems was used to provide power redundancy for Kohler’s hospitality tents. A Kohler 175REOZT4 Tier 4 Final diesel unit was used as the primary power source and a Kohler 125REZGT – an EPA-certified gaseous unit that runs on LP – served as a secondary power source. Kohler Power Systems is a division of Kohler, headquartered in Kohler, Wisconsin, US. It has more than 50 manufacturing locations worldwide. Its global service and support network, with more than 800 locations worldwide, provides aftermarket support services to guarantee the satisfaction of their mobile generators and other products.